Everyone is back where they should be after the Easter holidays and suddenly I find myself on on my own for a couple of days. Although I have things I should be getting on with, I decide to take a break and do some painting and drawing. Go to the art shop and buy a couple of sheets of lovely 300gsm watercolour paper. Stop off on the way home at Morston quay and buy a cup of coffee from the National Trust shop. Drink coffee and take in the view and general hustle and bustle (boats being put in the water for the first time this year, dog walkers, seal boats loading up to take people out to Blakeney Point). Enjoy the sunshine. Follow the path along the creek and across the marsh with sketchbook and pencil in hand. Stop every now and again and draw what catches the eye. Get out painting equipment, put on music (Bach, Brandenburg Concerto’s) and spend the rest of the afternoon painting (keep half an eye on the morning’s drawings but paint mainly from memory). This entry was posted in documenting, drawing, landscape, looking, painting, walking, watercolour and tagged creek, landscape, marsh, Morston on April 28, 2017 by debbielyddon. There is only a week to go before the Knitting & Stitching show! Nearly everything is packed up in copious amounts of bubblewrap and I am running around deciding on slightly strange things like how to transport 2 buckets of dry sand without it spilling out everywhere. Today I’ll give you a bit of information about the main part of the Moments of Being body of work – The Sluice Creek Cloths. Sluice Creek is a tidal inlet just off the main channel at Wells-next-the-Sea. It runs north/south and narrows to the north in a labyrinth of seemingly endless inlets and creeks. It is a quiet place but at the same time it teems with life and movement – there is always something new and interesting to see and experience. The Sluice Creek Cloths are inspired by the memory of encounters with physical processes that I have encountered whilst out walking or sailing: the sun moving over the marsh and creating shadows, the clink of halyards knocking against masts, the shape of a bend in the creek or the way saltwater marks my clothes. I have invested a huge amount of time and effort in these cloths and they have taken me about 18 months to make. There are seven cloths in the series. Each one is made from linen and hangs double over a shiny, varnished pole. The mark I have chosen to use as my personal notation for this body of work is the hole. It is a space – an immaterial emptiness that is surrounded by a physical material that describes its shape and allows us to see a nothing. The holes I have sewn into the linen of The Sluice Creek Cloths are edged with thread-bound iron wire. These evoke the small metal eyelets and fastenings that are in tarpaulins, boat covers and sails found in a coastal environment. Each cloth has been dipped in the sea several times to rust the eyelets and to mark the cloth. The information I have written over the past three posts has come from a book that I have designed and self-published to accompany the Moments of Being exhibition. It is a 20 x 20cms, soft-covered book with 60 pages. It includes text that describes my inspiration and way of working and has photographs that I have taken myself of the work and the environment that inspired it. It will be on sale at the show next week. It will also be on sale after the show in my shop. Do come and say hello if you are there! This entry was posted in exhibiting and tagged beach, cloth, creek, exhibition, holes, landscape, marsh, Moments of Being, new work on September 27, 2016 by debbielyddon. It is only three weeks now until the Knitting and Stitching show and I have finished making all the work for my gallery. There are just the fiddly (but surprisingly time consuming) things left to do to make sure that everything is in perfect order – finishing off, sewing in ends, thinking about what I need to actually hang the work and other paper/computer related things. I thought that in the lead up to the show I would give you a taste of what I will be showing and a short explanation of the work’s inspiration. First the title of the work – Moments of Being. Moments of Being is a concept that occurs in an essay by Virginia Woolf called A Sketch of the Past. In it she wonders why it is that some ordinary, but powerful memories rise above the forgotten trivia of everyday life. She concludes that there are two types of experience: moments of non-being and of being. Moments of non-being are experiences that one lives through but are not consciously aware of, whereas a moment of being is a flash of conscious awareness. My new body of work is inspired by a series of vividly remembered encounters and engagements with the marshes and beach of the North Norfolk coastline. I have taken my own quite ordinary, but powerful, recollections to form the basis of the work. Each work notates the memory of a commonplace event or observation: the sun moving over the marsh and creating shadows, the clink of halyards knocking against masts, the shape of a bend in the creek or the way saltwater marks my clothes. These are not unusual experiences, but are personal and intensely remembered moments. The last of this work to be finished is a set of 16 small Marshscape Collages and so I’ll start there. The collages are mounted on thick board and framed with a waxed cloth border. They are 20 x 20 cms each. The collages have been created intuitively. They are images of the Norfolk coastline that come from my memory: the shape of a bend in the creek, the rocking of moored boats or the outline of the saltmarsh. They are about shape, colour, light and space. I have made them from bits pulled out of my big bag of odds and ends (mainly unfinished or discarded work and left-overs) and specially painted paper and cloth. It is rather like doing a puzzle. I move shapes and colours around until they suddenly jump into the right place – what Sandra Blow calls that ‘startling rightness’. The first of the Knitting & Stitching shows is at Alexandra Palace, London from 5 – 9 October. Please do come and say hello to me if you are there. This entry was posted in collage, making and tagged beach, creek, exhibition, information, marsh, new work on September 12, 2016 by debbielyddon. I am back in Thames Ditton after 10 (very hard-working) weeks in Wells. Although I’m sad to leave, I’m looking forward to a busy autumn. I have finished all the work for the Knitting & Stitching shows and I only have the details to sort out now. As a result I am beginning to feel a little bit excited! Here is what I saw as the light gradually faded. This entry was posted in looking, walking and tagged boats, creek, landscape, sea, Wells on September 4, 2016 by debbielyddon. Despite the fact that it has rained just about everyday for the last few weeks the paths along the edge of the marsh are dry. In winter they are permanently wet and muddy – too muddy to walk along without wellies. However the irregular intervals of warm sun and wind at this time of year, coupled with a week of small tides, means that the paths have dried out to a crazy paving of cracked mud and they are now negotiable. I reach the hut (portacabin) where I was hoping to sit and draw but someone is there before me, perched on a convenient ledge, face up to the sun and quietly enjoying the heat. This is a favourite spot and I have sat here and drawn many times. I move on and find a dry, sand-pebbled spot at the end of the point overlooking the Scolt Head channel. The tide is out and there are many birds poking about in the mud. A group of oystercatchers chirp continuously with their ‘peeping’ call. They run around on short, red legs and then suddenly rise up, black and white stripy wings flashing in the light, only to land a few yards away, to continue feeding, talking and bickering – a typical family. A streak of white comes in from the left and lands. Elegant legs and a crooked neck. A little egret stands out brightly against the dark mud. These egrets are a common sight here now on the marshes. At this distance I can’t see its bright yellow feet. Gulls wheel on the thermals and a skylark rises up from the dunes behind me. Its melodious song strengthens as it flaps its wings and climbs higher and higher. It is still singing half an hour later as I get up and walk on. This entry was posted in landscape, listening, looking, noticing, walking and tagged creek, marsh, place, sound on July 16, 2016 by debbielyddon. 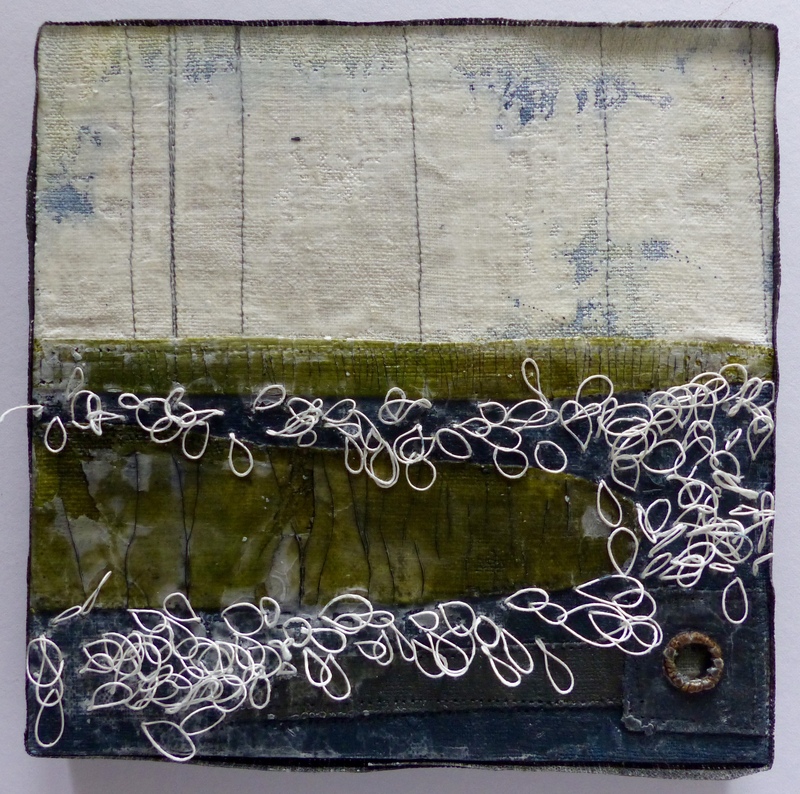 The work I have been concentrating on for the past 9 months is for the autumn Knitting and Stitching shows and is, as always, inspired by the North Norfolk coast. It comprises a major new body of work The Sluice Creek Cloths. Sluice Creek is a narrowing watercourse that runs off the main channel at Wells-next-the-Sea and from it spring a network of meandering creeks and tributaries. Running through the saltings its banks are rich with mud, sea lavender, samphire and birds. Rotting posts, the remains of bridges and jetties, dot its edges. On the highest tides the whole area is totally covered by water but at low tide the water drains away to leave a slick, shining surface rich in nutrients and teeming with life. It is a complex, ever-changing place and I have sailed here at high tide and walked over the mud. I know it well, but its twice daily ebb and flow means there is a continuous transformation and it hasn’t given up all its secrets to me yet. The cloths reflect a series of vividly remembered encounters and engagements with this place: things I have heard and seen and noticed. Each work notates an ordinary but memorable, event: the movement of the tides, the sun moving over the marsh and creating shadows, the clink of halyards knocking against masts, the call of a curlew or the moment the moon rises above the horizon. So far I have made four cloths and I hope there will be more. I’m not ready to show them yet (I will do before long), so in the meantime I have been playing around with my new printing press and these drypoint, collograph and carborundum prints are trials! They are of Sluice Creek and are drawn from memory. 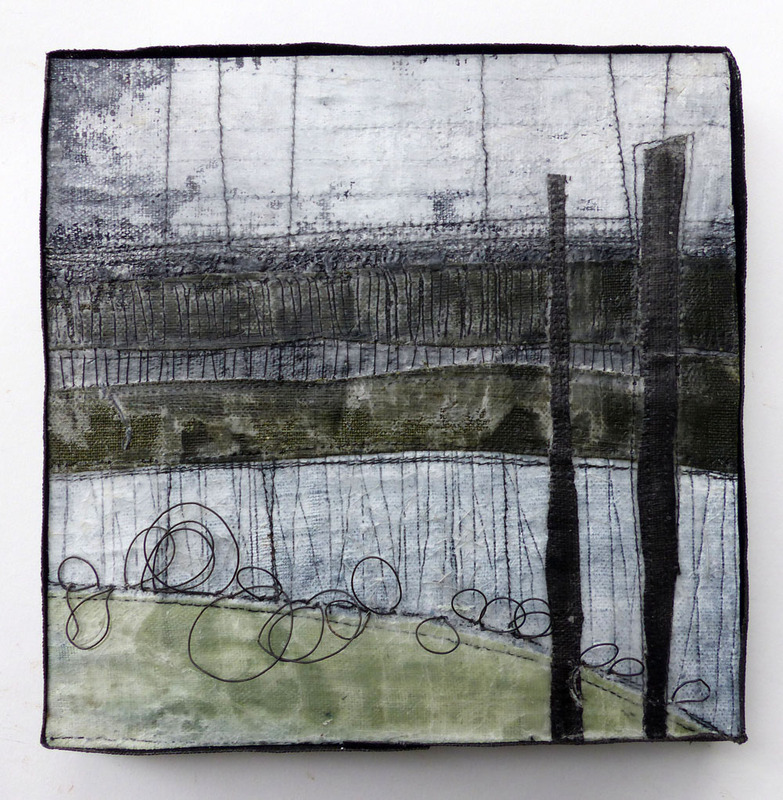 This entry was posted in drawing, printing and tagged collograph, creek, drypoint, landscape, marsh, new work, place on April 19, 2016 by debbielyddon. I’ve been thinking about how I record and document the experience of my surroundings. Of course I use my eyes, and at first looking appears to be the dominant sense. As I walk I’m mindful of what is going on around me – I literally have to look where I’m going – but it is only when I sit still that I really begin to pay attention. Stillness allows me to take time to search out detail and choose what is worthy of recording. I look, but I also listen and feel and smell (I don’t taste very often!). My senses shift from listening, to looking, to feeling as I become aware of the change and movement around me. It seems that one sense always dominates and the other senses back it up. If I hear a sound I look for it. If I see a movement I listen for evidence of it. If I stub my toe I look for the cause. Nothing happens in isolation and I need all senses to fully comprehend. ‘wind in the reeds sets them waving and shifting – red/green movement – a huge continuous rushing and swooshing’. So how do I record these sensory noticings? Drawing? Photograph? Sound recording? I do all of these things. Although texture is visually referred to in drawing and photographs and a visual picture jumps into your mind of what is being listened to in a sound recording, I like to complement these documentations with words and my sketchbook has as many pages of writing as it has drawings. ‘the tide has moved the mud into ridges along the sides of the meandering rivulet. The sun catches them and casts deep shadows. A curlew calls’. Sometimes I write down simple facts: the weather, the sounds I hear, colour and changes of light. I have a great fondness for lists: lists of birds I’ve seen (if I know their names), lists of objects found and just lists of words. I love a Thesaurus and I frequently write a list of synonyms for one word (I find it can spark new ideas) and I love it when I discover a new word. Often I write a single sentence noting a change of light or how a bird calls as it takes off from the marsh. Finally I write pages of noticings that are a stream of consciousness – observations (not great works of literature) that I scribble down as they occur. You can’t hear the waves breaking. There is no source – it is enveloping. Words are a complement to my drawing and although I seldom make work that comes directly from either of these activities, the discipline of recording ensures that I stop, take notice and fully document each phenomenological observation. I am always searching for something new and the knowledge I gain through the process of documentation widens my scope and gives me a greater understanding and thus more possibility as I start creating. This entry was posted in documenting, drawing, listening, looking, noticing, writing and tagged creek, landscape, marsh, sketchbook, sound on March 8, 2016 by debbielyddon.